Christopher and I had Saturday off together and we’re trying to figure out what to cook for dinner. I suggested veggie burgers, and Christopher goes ” How about spaghetti? 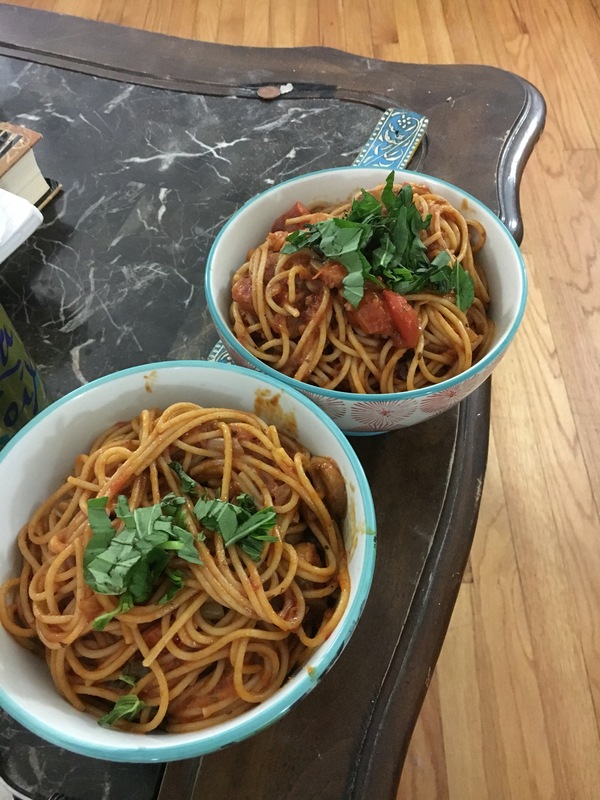 I love your spaghetti.” So that’s exactly what we did: My homemade tomato basil sauce with whole wheat spaghetti. 6-8 fresh tomatoes. I used 1 red tomato, 1 orange tomato, 2 yellow tomatoes, and a handful of fresh cherry tomatoes. Put the olive oil in a large pot on the stove on low heat. I used my dutch oven. Now chop up your garlic and shallot very finely and throw them in the pot. It’s important that it’s low heat so the garlic doesn’t burn. You’re really just heating the garlic and shallot up to release the aromas into the oil. Give it a good 5-7 minutes on low heat. Next, chop up your chosen tomatoes into small pieces and put them in the pot. Turn the heat up to medium. Add the canned whole tomatoes well. Be sure to strain the juices from the can out. We don’t want that going into the sauce. Stir those around and try to squish them up as much as you can. The sauce will appear watery but don’t panic. The tomato paste is going to thicken it up. Now it’s time to add the tomato paste and mushrooms. I used 8 medium sized crimini mushrooms, chopped in slices. Stir those around and watch the sauce thicken. Next add 1/4 cup balsamic vinegar, dried oregano, salt, pepper, crushed red pepper flakes and fresh chopped basil. Don’t be afraid to go to town on the basil. I used at least 8 large leaves chopped up. For the spices listed above, season to taste. Start with a teaspoon of each and then taste. Need a little more heat? Add some more crushed red pepper flakes. Need some more zing? Add a splash more balsamic vinegar. Some extra oregano is always good idea. Let the sauce simmer on low heat for at least an hour, stirring occasionally. Now the only thing you have to do is boil some pasta and add it to the pot! Yes, I’m using pre-made pasta. I will have to tackle making fresh pasta in the future. After you strain the pasta and add it to the pot of sauce, stir it around for at least 3 minutes. This gives the pasta an opportunity to really absorb all of the flavors of this sauce. Dish it out, top with fresh basil, and enjoy! Happy Christopher with his pasta!